IHG has released the full list of the newest Pointsbreaks hotels and here they are. This set has 100 hotels included with the actual booking of the hotels at these rates opening on Monday April 24th for stays between that day and July 31, 2017. For those who travel domestically we see the list of Canadian properties increase to 6 from the typical 5 hotels. Still wish we would see more Canadian properties participate. Why are IHG Rewards Club Point Breaks such a great deal? Because they offer reward nights at participating IHG hotels Worldwide for only 5,000 Rewards Club points. For those of you not to familiar with IHG Rewards Club , normal redemption rates for Rewards Club reward nights run from as low as 10,000 points for some Holiday Inn and Holiday Inn Express locations to 50,000 points for ultra-luxurious InterContinental locations and even these locations can participate in Point Breaks. So as you can see you can receive a discount of 50 to 88% off the regular redemption rates. You may be thinking that the high end hotels won't participate but they do depending on the time of year! Please note that like most loyalty promotions these offers are capacity controlled so I advise to book sooner than later to ensure you get the PointBreaks rate. 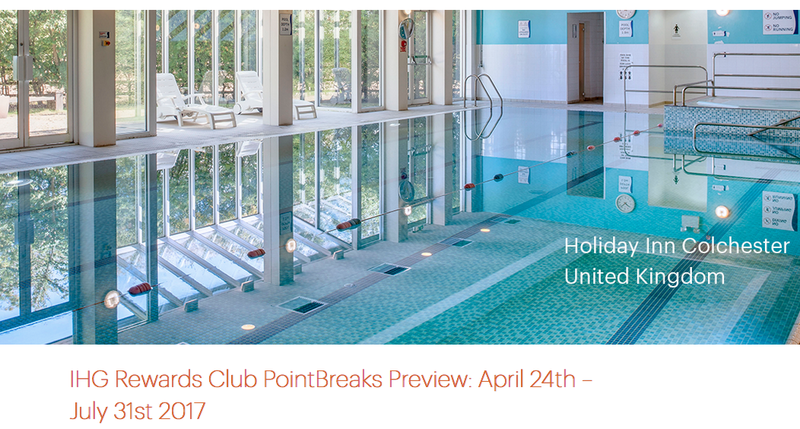 These offers will be bookable via the primary Pointsbreaks page as of April 24th.